To encourage kids interest in classic cars, Hagerty International invited its Junior Judges to vote for Car of the Show at Chris Evans hugely popular CarFest North, in aid of BBC Children in Need. These judges, aged from 8 to 14 years old, were given the job voting for their favourite classic car on the car club stands in the glorious sunshine at Cholmondeley Cadstle last weekend. Mk III as well as a Moskvitch 427. 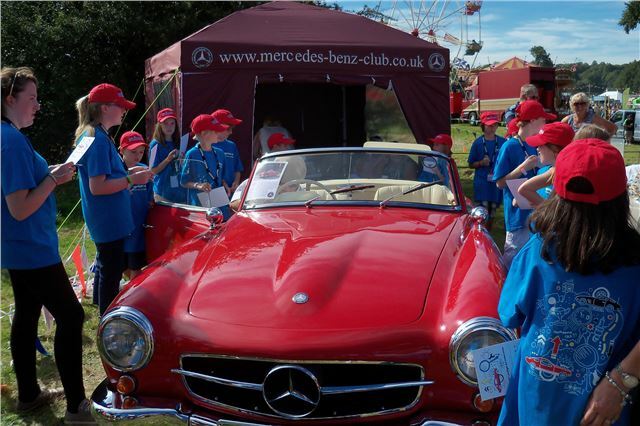 However, the children voted unanimously for Graham Durber's recently restored 1960 Mercedes Benz 190SL. Local Junior Judge Josh commented, "this carwas the one we all agreed we wanted our Dad to have in the garage at home." On receiving his award from the Judges and Children In Need's Pudsey Bear, Graham said, "this is a brilliant program. It is essential that we all try and give the kids a better understanding of classic cars so that they can become the next generation of enthusiasts." Organised by Hagerty International, the UK's classic vehicle insurance specialist, the programme connects young car enthusiasts with a variety of classic cars and vintage motorcycles, to help connect kids with historic cars and bikes. "We appreciate that we need to do all we can to encourage children to see, feel and learn a little about classic cars." stated Hagerty MD, Angus Forsyth. "Our Junior Judges program gives them the opportunity to get up close with these fabulous vehicles and we hope this ignites their interest in older cars." Hagerty Insurance Agency, LLC is the leading insurance agency for collector vehicles in the world and host to the largest network of collector car owners. Hagerty offers insurance for collector cars, motorcycles and even "automobilia" (any historic or collectible item linked with motor vehicles). Hagerty also offers overseas shipping/touring insurance coverage, commercial coverage and club liability coverage. UK-based subsidiary, Hagerty International, was established in 2006 to cater for the parallel market sector in the UK and Europe, and now offers a bespoke portfolio of insurance products, underwritten by Hiscox and Axa Assistance. For more information, visit www.hagertyinsurance.co.uk or tyher USA office at www.hagerty.com .